One of the elongated blocks of student flats built in the 1960s by the architect Maarten van Wensveen has been radically recast. 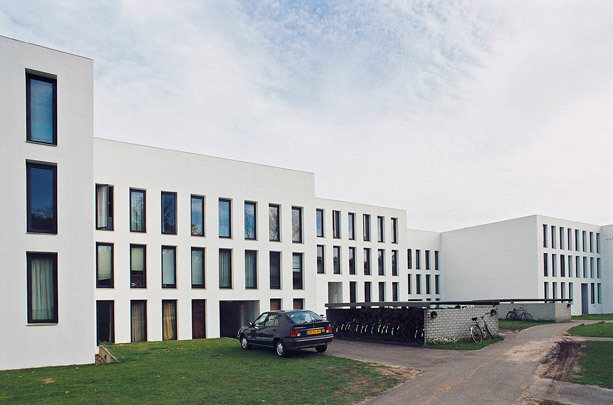 The front and rear facades have been shifted two metres to enlarge the tiny rooms, which have been clustered in groups of five or six per living area and provided with a common room. The new facades are white rendered with tall, narrow windows in deep-set frames. This makes for a maximum contrast with the existing horizontally articulated buildings. The entrance halls are clad in white marble and have toughened glass doors -a luxury indeed for student flats.